Create calendar pages for special events such as summer camp or a countdown to the holidays, or for general use such as during the school year or summer vacation. You can print calendar pages from many websites and computer programs, or you can make a calendar sheet by hand with a few supplies found in most homes. Create a calendar sheet with six rows to accommodate all months without doubling up dates within a single space. Use extra spaces for notes or embellishment, if desired. Lay the paper on a firm, flat surface. Position the edge of the ruler against one long edge of the paper and draw a line along the other edge of the ruler to form the top heading of your calendar sheet. Draw a line 1/4-inch from the edge on both sides and across the bottom of the paper to form a border on your calendar sheet. Position the edge of the ruler against the line across the bottom of the calendar sheet and draw a line between the side borders along the other edge of the ruler. Reposition the ruler against the new line and draw another horizontal line along the other edge of the ruler. Repeat this process four more times to create six 1-inch rows and one 1/2-inch row under the top heading line. Place the end of the ruler against one of the side border lines at the bottom of the calendar sheet and draw a dot every 1 1/2 inches horizontally across the paper. Repeat this process in the center of the paper and along the top heading line. Align the edge of the ruler vertically with one series of dots and draw a line from the base of the top heading line to the bottom border line. Repeat this process five more times, once for each series of dots, to create seven columns. Write the month and year above the top heading line and add the days of the week in the seven spaces directly below the top heading line. 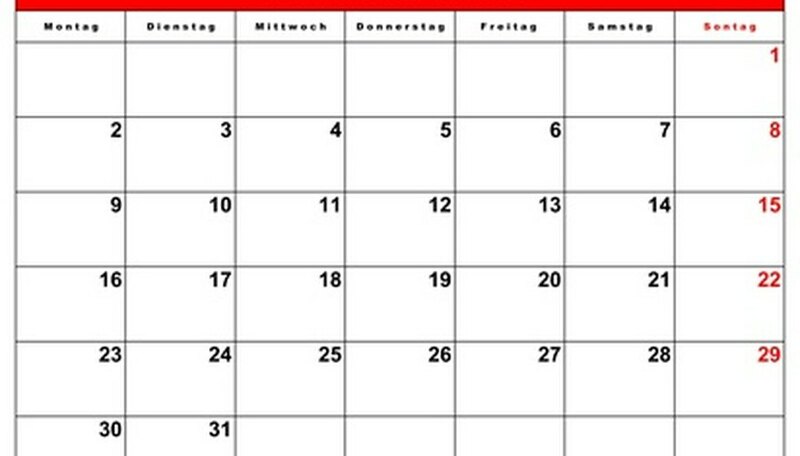 Fill in the dates for the month in the calendar grid. Embellish the calendar sheet, if desired. Use construction paper, card stock or specialty papers to create calendar sheets. A calendar sheet is useful for teaching small children the days of the week. Crystal Marie launched her freelance writing career in July 2009 after working for nearly 20 years in public health. She writes for various websites and holds a Bachelor of Arts degree in business and human resources management from Simpson University.